If you've read my post about the Do's and Don'ts of Contest Entries, then you know my stance on the corrective behavior about entering contests. Now I'm a pretty laid back person and I don't complain a lot. Heck, I don't even really talk about my personal life on this blog (except the wedding business but that's because you all begged me for it. And because I wanted to show off a little :) I don't mind a little mistake here and there. I've done it before, everyone's done it. No harm, the best is when you catch yourself and delete that wrong entry before I've even notice. Kudos bars (do they still make those? I haven't had one in years) to everyone who's done that. No, the problem lies with the people who continue to make these mistakes even though I've more than many times pointed out the rules of how to enter a contest on my blog. In case you somehow missed them, I always post my rules in bright red, and they are as big a font as I can get on blogger. They are also posted in the contests tab at the top of the blog, but here again for your added enjoyement. People please....I'm in my mid 20s. You are giving me more gray hairs on my head than I need right now! I've found that most of these mistakes that happen in the Contest Do's and Don'ts post occur whenever I post a Christian fiction giveaway. BTW you may say, it's such a minor thing, why don't you just get over it, it's not life and death. Ok you may say that but hey this is MY blog. Don't like it? Well. I don't know what to tell you. 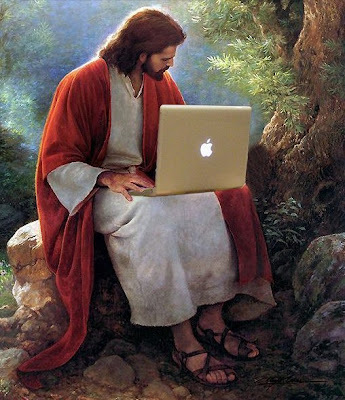 Which brings the question: How would Jesus enter a blog giveaway? Never mind the fact that I do give away some books that Jesus wouldn't enter for. I really don't think he'd read chick lit, iffy on the YA (I bet he'd win at The Hunger Games), although I'm sure he'd love the Christian fiction. I wonder if Jesus would go for the edgy stuff or the Amish fiction? And why yes, Jesus would read fiction contrary to the popular belief that reading stories is reading lies and we shouldn't' be doing it. Jesus told stories aka parables. Are you saying then that Jesus told lies? Would Jesus forget to leave his contact info when entering a contest? - Nope, because He always wants you to contact him. Whether you want to or not. Would Jesus leave his mailing address for everyone to see? 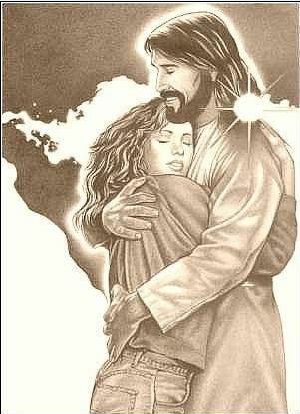 Ok well that one he might, but this may be the one time you don't want to do what Jesus does. B/C while he wants all of us to go find him in his big house, I don't think you want those random kooks at your house! To paraphrase Smokey the Bear, "Only you can prevent giving away your info to strangers!" Would Jesus enter for a contest after it's over and comments have been closed? Well even though Jesus is rather persistent and would like all his followers to be, I think when a door is closed permanently, it can't be open again. Would Jesus make sure he was entering the right giveaway and not enter on something that was not a giveaway? I think Jesus can tell the difference between right and wrong. Can you? Would Jesus use an alias to keep entering giveaways? Well he does have that whole Trinity thing going for him but I really don't think he'd use that for his advantage to win something (except maybe followers...I bet Jesus would have lots of people on his follower list, if he was doing a giveaway I bet you'd get extra entries for joining!). So what's the overall point of this post? The point is, I'm sorry for having to get all snarky and write a potential sacrilegious post like this. I know I may have offended some people and you will now all unsubscribe and hate me. I just feel like I've done as much as I can to make things as easy for people to enter and it still backfires on me. I feel bad having to disqualify and delete posts but if rules aren't followed then that's the way I have to go. If you can tell me how to make things more easier for you, please let me know. Hehehehe! I noticed today people followed my old giveaway instructions better without the red bold. I really don't know what to think about it anymore lol!!!!!! What? No angry comments yet? I'm amazed. And by the way, this is pretty much the best thing ever, Deborah. That IS an awkward picture! I have this happen on my blog, too, Deborah. Thankfully not that often. I just write them an email letting them know. I also make sure the word "email" is big and red so that it sticks out in my posting. I always have the word giveaway in my title, like you, so that it's clear whether it's a giveaway or not. I still get people who don't leave email address even when I say "No email=No Entry". I may have to snag your post if it ever gets out of hand. And let me apologize ahead of time if I somehow leave a comment asking to be entered into a giveaway when it's not even a giveaway. Sometimes I leave my email address when I'm only leaving a comment and not entering for anything. I'm sure you won't lose any followers. It's just common sense. Too funny. I've never really had those problems on my giveaways. I just realized that I follow your tweets but not your blog. Wow. Ok. Now I'm following yours :) Cheers! I thought this post was pretty funny. =) I hope all your giveaway entrants follow the rules now! Here Here Deborah! Great post. I too had the same problems on my blog before I stopped doing giveaways, although, I may do more in the future, I am still pondering whether I would do any more again. I commend your efforts on trying to make it easier for your followers to understand the rules that you put in place for yours! Love this post - and am glad there have been no angry comments yet! "People please....I'm in my mid 20s. You are giving me more gray hairs on my head than I need right now!" Hahahaha! I host giveaways on my blog, too... I feel a gray hair pop up (I'm in my 20's, too) every time it's obvious someone copied a previous contest entry (and it's WRONG)... why don't they read the directions? *sigh* It takes two whole minutes. If I don't have time to read and enter giveaways, I don't do it. Apparently not other people. Then some people waste two minutes by not reading the directions but commenting anyway. lol Oh well. LOL! Great post. I have no answers for you but I love the way you wrote this! I'm impressed that everyone kept their sense of humor (or at least didn't comment if they didn't). I have a feeling that Jesus is a funny guy when it is appropriate, so I'm sure he's laughing at this post. 24 Hour Readathon: Ready Set GO!!!!!!!!! !